I missed SL10B. 😦 But I hear that the sims are still up. Which is a good thing. Because even though I missed SL, apparently someone in SL was thinking of ME. I see from Dale that Shenlei has a display. 🙂 Thank you Shen!! 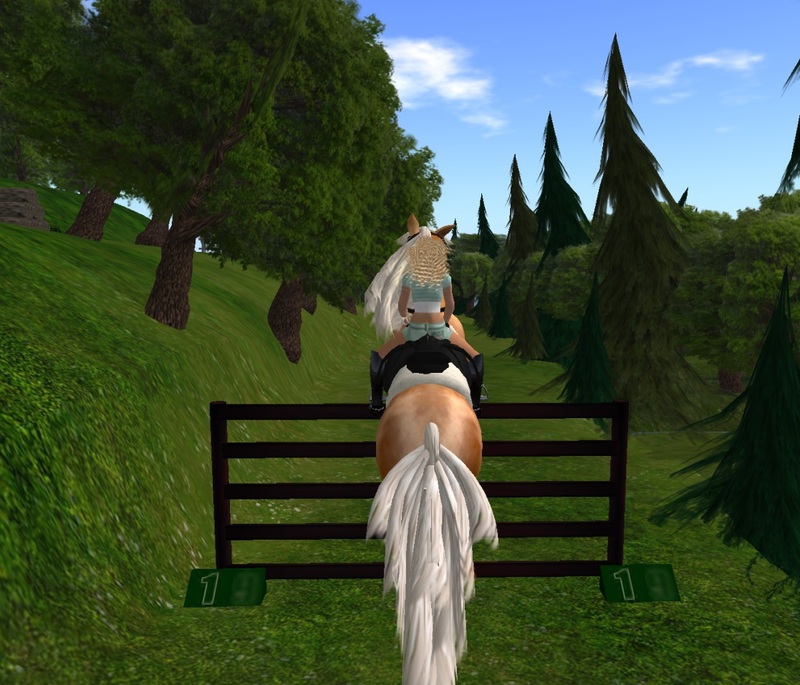 You were, are and will be one of my favorites in SL! And thank YOU, Dale – *grin* – stole your picture. You know what? Tomorrow will be AH5B. Almost forgot entirely. Krissy Muggleston fell in love with Bryn Oh’s The Rabbicorn also. Actually, everyone did/does. But Krissy has an excellent eye and is catching all of the subtleties and nuances that Bryn has embedded in the build. You should click through these links to see the fine detailed photos Krissy has captured. Obviously I need to go back and view it with a microscopic lens instead of my macroscopic emotions. 🙂 In the meantime, I have posted my pictures up to my Flickr account. Drama Dolls are still going strong. 🙂 I gave one as a gift yesterday because I needed to apologize profusely to some dear friends. 😦 I missed their wedding this weekend. It was on my calendar and everything. I feel terrible for letting them down, not being there to help them celebrate their joy. Unfortunately, sometimes RL is like that. I could not be in both places at once. So I gave them a Drama Doll, told them to name it Ahuva, and let me apologize abjectly and self-destruct. *grin* I gave them the link to the tutorial video as well. I know an author!! Shenlei Winkler (aka Shenlei Flasheart) has written a book. 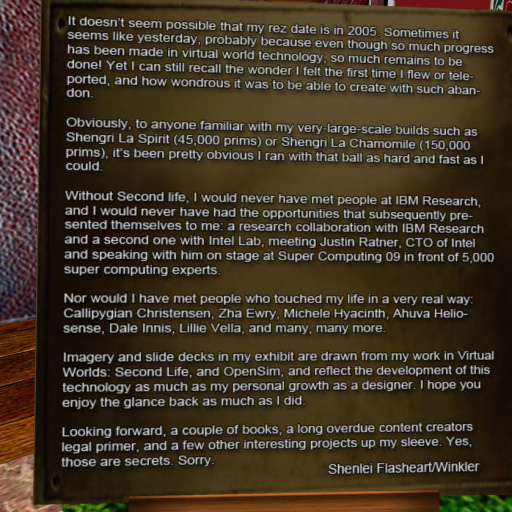 Actually, Shen has written MORE than one book and is working on others. This in addition to all the fashion work, mentoring new designers, teaching college courses, running a business, pushing the boundaries of opensim, running a real life and being a good friend. 🙂 This latest book is a text that focuses on the business of design for aspiring professional avatar apparel (virtual) designers. Very exciting. The book is Designing Dreams, available through Amazon. I feel a little silly. Remember many posts ago I talked about how my neighbor put up an unappealing object, right in the sight-line of my pool? I was so proud because I put up a fence and blocked it. Well, last night I got an IM from someone who pointed out that the object was on MY land. /me blushes profusely Yes, I DO own that little 16×16 parcel. It was an ad farm and apparently I never joined it to the rest of my land, so none of my group rules were in effect. So someone could and did leave garbage on my property. Thanks to the kind intervention of a stranger, that object has been removed. I will try to remember how to join the parcels, but in the meantime my group rules are in effect. This is very late. Graduation was back on May 31. I was still recovering from being ill. I did make it to the fashion show, took some pictures, but was still not up to blogging. But I do want to show you the set that was built for the students to model their outfits. I confess – my initial reaction was that I hated it and wanted to leave. I have RL issues with height and falling. I was still fairly dizzy and unstable from my illness. 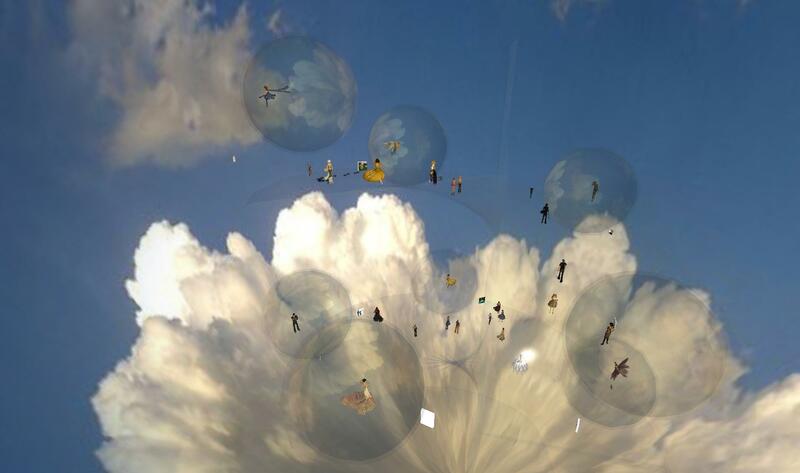 So to be up in the sky on invisible platforms – well – you can imagine. I was NOT happy. I needed a tp to get up in to the actual show and then I was afraid to move. But as I stood about and chatted with friends, I pulled my camera back. And that’s when I saw the whole build and understood the beauty and talent of it all. This build is what SL architecture and events can be. Think beyond the physical limitations of RL. 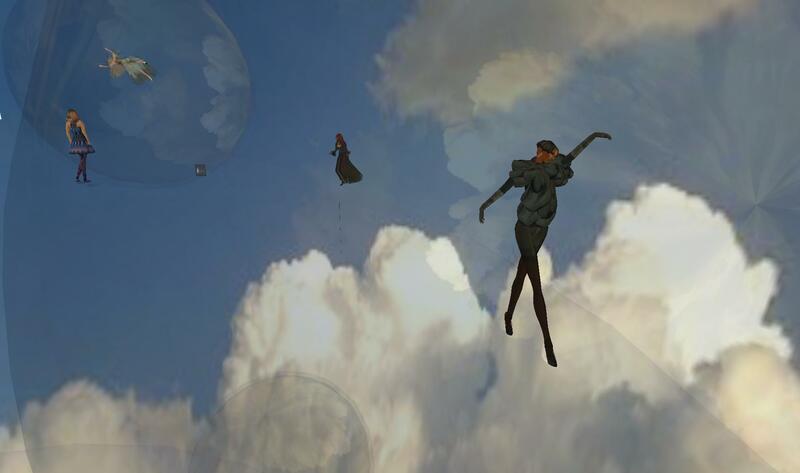 Floating in air, not chained by gravity or physics. I ended up really enjoying the build and appreciating how it allowed the students freedom to model their fashions. Yes, we can say that in all honesty. 🙂 Because you and I have known them for months! 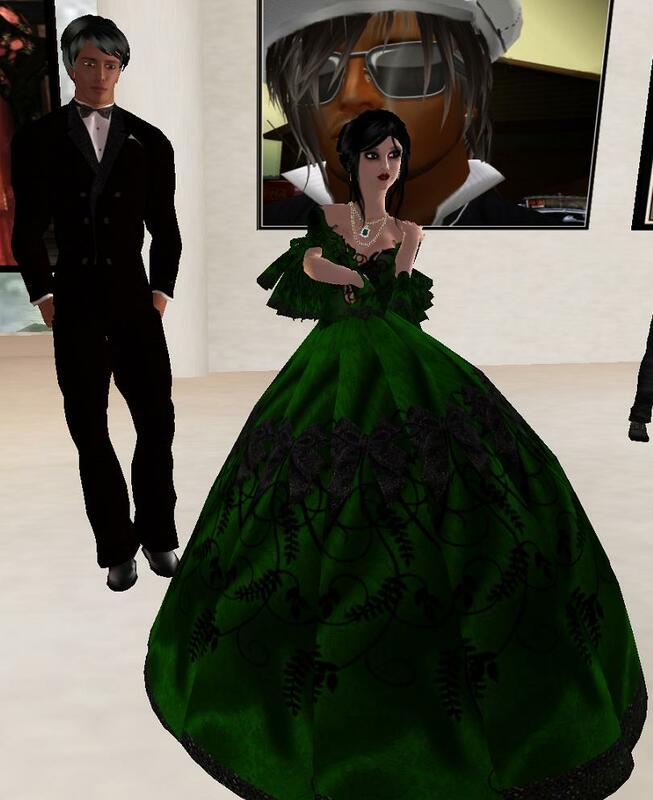 I believe that my first fashion show was also Jare’s first SL fashion show. I’ve been wearing Misteria’s gorgeous *PDD* Feather Dress for months. I get compliments on it every time. 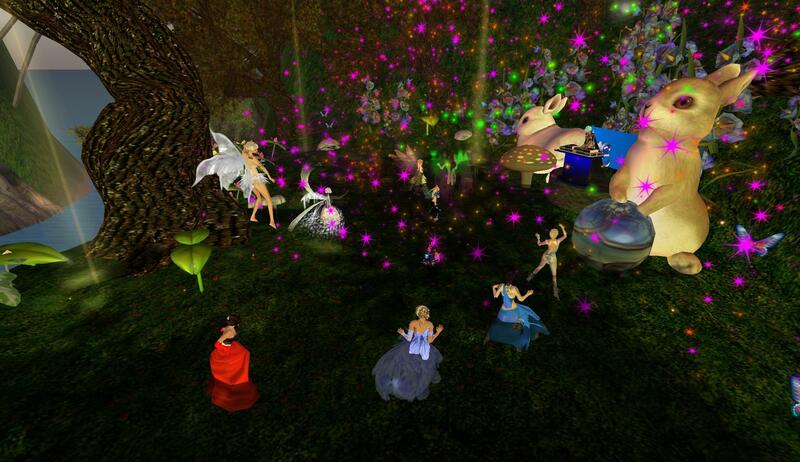 Don’t forget the dancing fairies extravaganza – that was also Misteria. I have a Wollemia Sands suit and just saw her great runway show. *grin* I feel like a proud aunt. I watched these designers grow up and blossom and really expand into fabulous designers. 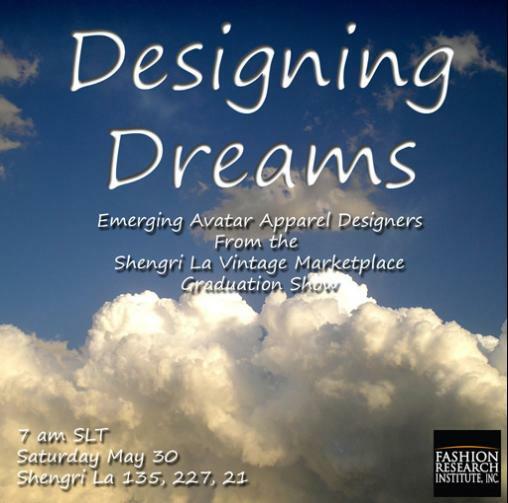 Join the designers and friends of the designers as we bid adieu to four of our fine designers who are graduating from the emerging avatar apparel program in the Shengri La Vintage Marketplace. Fashion Research Institute Marketplace designers Jare Capalini (Au V), Misteria Loon (Pas de Deux), Xand Nagy, (Kicks & Twirls), and Wollemia Sands (Bull & Bear Careerwear) each showcase two of their styles apiece in this special graduation installation, created to highlight the dreams they have designed while in the program. Please join us for this uniquely designed installation of fashion displayed artistically. Designing Dreams is hosted and sponsored by the Fashion Research Institute, Inc. FRI is committed to assisting emerging avatar apparel designers to bring their brand to the next level through programs ranging from courses for aspiring professional designers to incubation and mentorship programs. For more information about FRI and its programs and activities, please visit http://shenlei.wordpress.com. 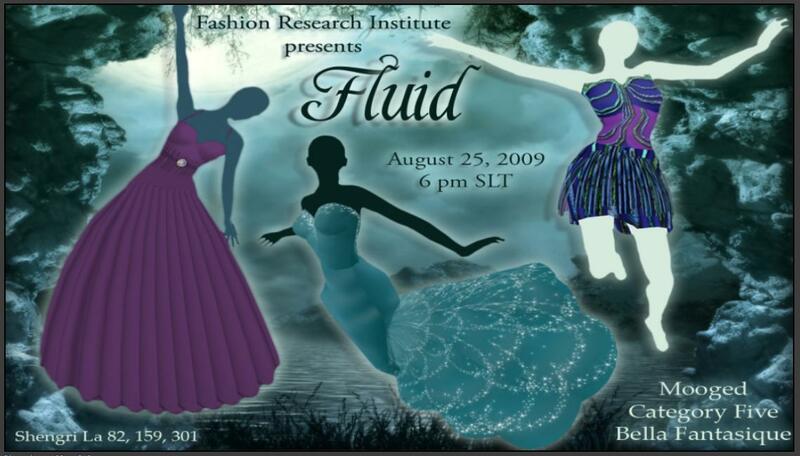 (c) 2009 Fashion Research Institute, Inc. Some weeks I have nothing much new or interesting to report about my life. Other weeks – I can’t catch my breath. Last week was breathless. I got half of what I wanted to report posted a few days ago. 🙂 Now here is the rest. Shengri La turned 3 years old recently. It is my great fortune to be friends with Shenlei. I attended most of the celebratory events. 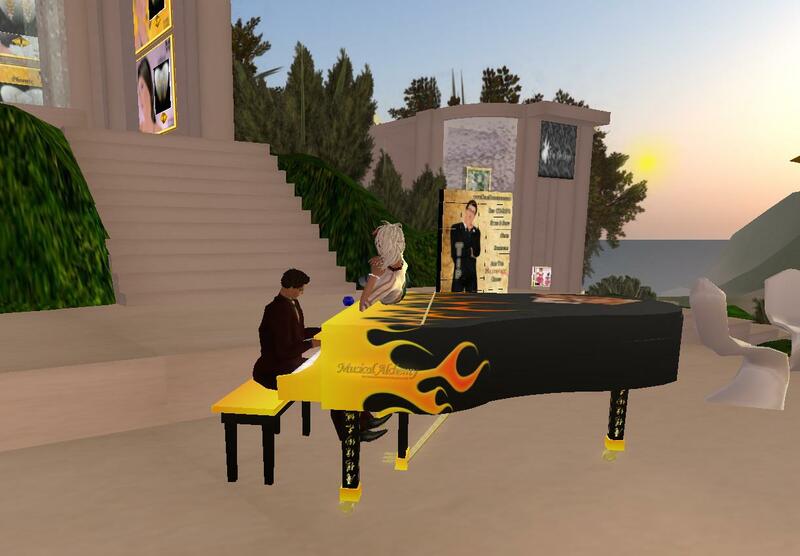 They ran the gamut: unveiling of the FRI’s Spirit Opensim, fashion show, art gallery opening, special surprise tribute to Shen, musical concert and of course a Rave. We had a rehearsal for our dancing fairy fashion show. 🙂 That should probably have been a post in and of itself. But that’s not happening. Just know that we had fun hanging out and meeting each other at the rehearsal. Oura had already enlisted, but we got Krissy to come and join us as well. Besides the dancing fairies we had fairies perched on leaves and on bunnies. I can’t help but smile everytime I see those bunnies. LOL. We had such an amazingly fun time stalking those lucky stumps for the bubble chairs. And then collapsing all over the bunnies. Hey Shen – we haven’t cut loose and done anything quite that ridiculous in awhile. I think we are overdue. We both need to take a break from work and go PLAY! So here I am as a fairy. Not my usual look. I find that the wings tend to make my back itch. 🙂 I even turned my eyes blue to match the dress. Although the hair isn’t my typical look either, I find it’s growing on me. Most of the other fairies had updos or, if they didn’t have to wear wings, flowing locks. I chose the Defiant Punk Fairy look. 🙂 Maybe if I feel really daring I will post my private Defiant Fairy IMs. If I weren’t so opposed to personal pain and puncturing my body – I’d have been wearing a nose ring. 🙂 I don’t think that I am really fairy material. As you know, I am really really fond of wearing jeans and boots. 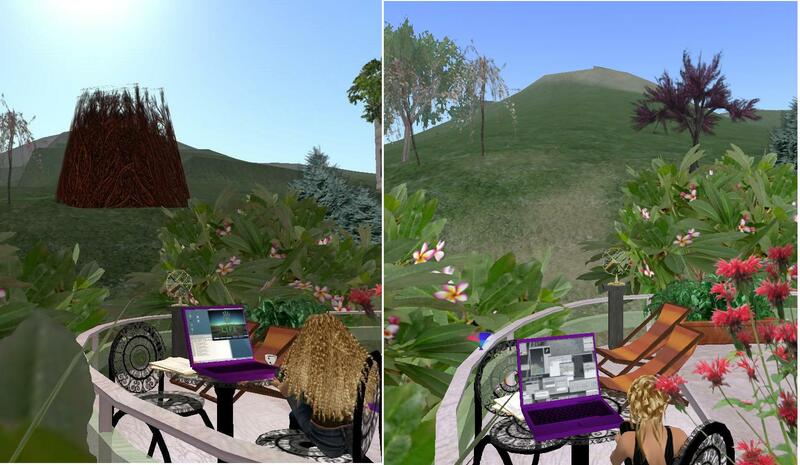 In SL and RL. I like my hair down and curly and I like my jeans tight and straight and I like high heeled boots. But sometimes even I concede that a change of outfit is necessary. I was invited to the special sneak preview of a new exhibit of images of Shengri La Spirit (FRI’s OpenSim) shot by Callipygian Christensen. That event certainly required a bit more flare than jeans. So I knew I had to go shopping. LOL I turned to Honour for help. Now if you know Honour you KNOW that she ALWAYS says how much she hates shopping, how it takes a gun to her head to make her go. Well lately – Honour has been taking ME shopping. She got me looking for clothes at the RFL a few weeks ago. And she gave me the name of two stores where I could find cocktail party attire – Vindaloo and Baiastice. Not only did she steer me to the stores – she joined me there to help me decide. 🙂 So now I feel I am fully justified in teasing Honour – calling her my personal shopper! But you know what – I got compliments on both outfits. So you did good, Honour! Thanks! You can see the Baiastice outfit in one of the pics below. What was truly funny about this FRI event was the contrast between the male and female guests. *grin* The women had ALL dressed for the event – formal or cocktail attire. The men – nearly all in scruffy jeans and T-shirts. It was really very very funny. Even funnier to me on a personal note… As I’ve mentioned, I’m in charge of a mall in OpenSim. Well, the gentleman who asked me to take on that responsibility was at this party. I IM’d him and said “Hi! Great to see you!” He replied “Have we met?” rofl. Um, yes. So I wrote back and pointed out that this was the REAL me, and that if he ever got hair, boots and AOs working to my standards in our sim, this is who I would be and how I would look. *grin* Until then – he gets Summer. Sigh. Poor Summer. Callipygian Christensen is not only a phenomenal photographer. She is brilliant. Calli and Shenlei have been friends forever. *grin* That’s a relative “forever”. Calli had an exhibit opening at Shengri La, timed to be part of the Shengri La Emergence Day celebrations. Calli wanted to do what so many of us would like to do: thank Shen for all the wonderful things she has done for both her friends and the community and world at large. Calli didn’t only want to do it – she figured out the most fantastic, personal, wonderful, special present a person could have. Calli commissioned Kyle Beltran to write a piece of music, inspired by and about Shengri La. We all knew that Calli was going to surprise Shen at the art opening, but we did not know WHAT the surprise was. It was breath-taking. Kyle’s composition is truly wonderful: moving, evocative. You can hear the waves on the shore, see the butterflies, smell the flowers. Shenlei is truly blessed to have such wonderfully thoughtful, creative, caring friends. We stood about toasting Shenlei with champagne as we listened to Kyle’s music, surrounded by Calli’s art. (Can you see Oura’s pictures on the walls? And find me in my Baiastice dress.) Honestly – I know that the Shenlei was not the only one with tears in her eyes from the beauty and love shown in that gift. Calli and Kyle – you are amazing. In the afternoon, Kyle Beltran entertained us with his singing and music. Kyle gives a wonderful show. He is witty, charming, good-natured, plays the piano wondefully and I love listening to him sing. There were many of his faithful followers there but we also had a fairly steady stream of newbies coming through as well. 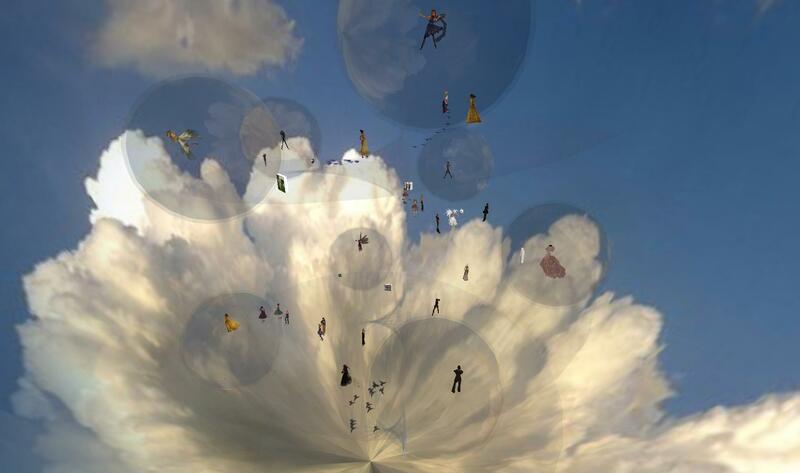 Remember – FRI Shengri La is an official SL Gateway. 🙂 It is interesting to watch the newbies mingle with the oldies. *grin* I DO remember what it was like to be a noob. Believe me – I am NOT laughing at them. I think that part of me smiles because I think what a great adventure they have ahead of them. Part of me smiles because I’m glad I finally learned how to walk across a room without crashing into everyone. 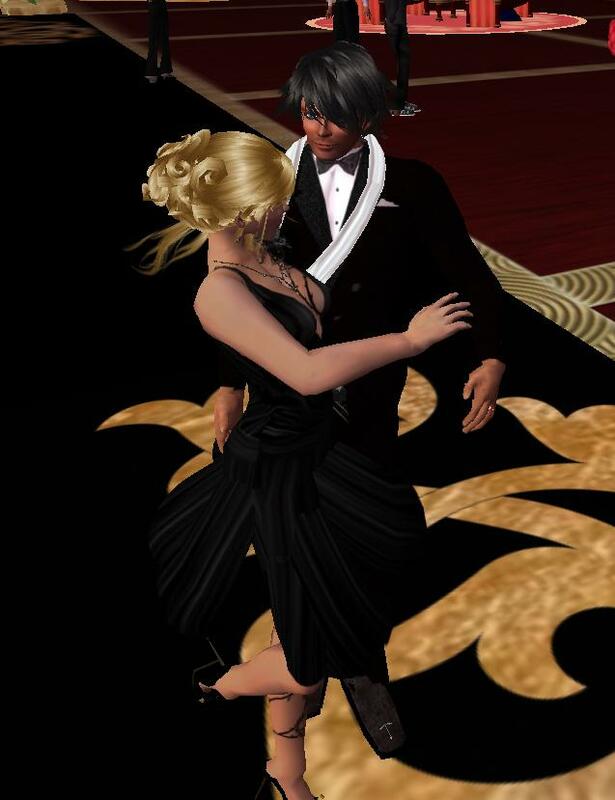 (well, usually) And certainly some of the outfits they put together are no odder than ones I’ve seen by people who have been in SL a long long time. No celebration would be complete with a Rave. 🙂 So the evening ended with a Fairy Rave in the fairy fashion grove. Yes, the attire was fairy. 🙂 So I put my wings back on, took off my boots, and flitted my way to the Rave. Had a wonderful time chatting and dancing.